Here at Rase steels we strive to supply all our customers with the correct Zed Purlin and Cee Section system to meet their requirements, in the fastest and most cost effective manure. The Zed Purlins and Cee sctions are available in a variety of sizes and thicknesses all of which can be manufactured to your individual requirements. 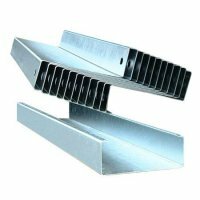 Zed purlins and Cee sections are the perfect solution to support a variety of cladding systems, whether it be COMPOSITE PANEL, BOX PROFILE AND CORRUGATEDor FIBRE CEMENT.